Adaptability and flexibility are intrinsic to the IKEA brand. We have the opportunity to build upon these concepts by providing our passionate consumer base with a mobile iOS app. This tool allows users to explore and share inspiration to expand their perspective of the IKEA product line. As IKEA ‘hacks’ are already prevalent throughout the DIY space, an IKEA curated platform encourages a stronger customer-brand environment. By leveraging the features of the existing IKEA Store and IKEA Catalog apps, users will have a brand new tool to browse and tag their creations with the corresponding IKEA products. Not only can users browse creations shared by others, the app is also designed to allow products to be scanned in-store to show the lineup of IKEA ‘hacks’. 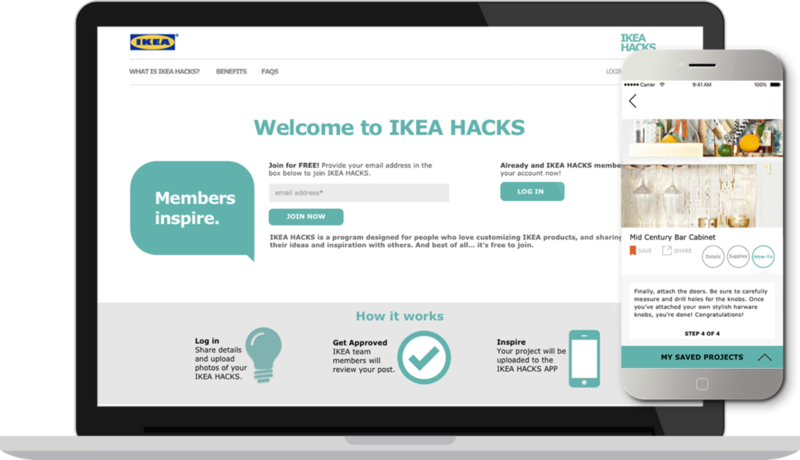 Once users' ideas are submitted, IKEA staff would review and publish posts to both the app and website. Photographs of the finished piece along with a step-by-step guide will be available. Users can save and share favorites with friends through messages, emails, Facebook or Pinterest.